a breed of red, red-roan, white, red and white, roan and white dual-purpose cattle. Polled varieties exist. Also Dairy Shorthorn, Australian Illawarra Shorthorn, Beef Shorthorn, Milking Shorthorn. Characterization of DRB3 alleles in the MHC of Japanese shorthorn cattle by polymerase chain reaction-sequence based typing. Frank Milnes, secretary of the Beef Shorthorn Cattle Society said: "The Ballylinney herd is one of the largest herds of Pedigree Beef Shorthorns in the UK. Anne was very enthusiastic about her work at the farm which has 240 acres and a 51 herd of Beef Shorthorn cattle. Having recently introduced a new herd of Shorthorn cattle on to his farm, Maxwell decided to introduce eradication as part of his breeding policy. 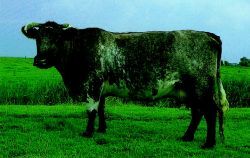 The original Shorthorn cattle were very much dual-purpose animals but subsequent breeding, and selection for specialist beef traits, led to a division of the herd book and the formation in 1959 of the Beef Shorthorn Cattle Society. And the grown-ups weren't left out either, with the chance to meet the Newsome farm's herd of beef shorthorn cattle, dig fruit and vegetables and have a guided tour. Increasing awareness from large retailers has meant brands such as Aberdeen Angus, Hereford and Shorthorn cattle are being sold to supermarkets at a premium price, representing a niche market for many producers. Ian Harries and Eiddwen Harries of Pontarddulais Road, Cross Hands, found success with their Holstein and Dairy Shorthorn cattle. Archie Harris, from Sandwell Park Farm, which houses a number of rare breeds including the Large Black and Gloucester Old Spot pigs, Shropshire sheep and Longhorn and Shorthorn cattle, backed the idea of extending the gene bank. The Baines have had an excellent showing season with their Ayrshire and Shorthorn cattle this year. Owain is very keen on Shorthorn cattle and is on placement with a top pedigree breeder in Kemys Commander, Monmouthshire.